160 exhibitors will showcase the latest innovations, technology and services available. From parcel sorting and dimensioning to digital marketing and e-commerce solutions. From last-mile delivery innovations to network services. From returns solutions to air cargo transport and much, much more. The world’s leading international postal and parcel industry exhibition and conference heads to Amsterdam in October 2019! PARCEL+POST EXPO is the leading global event for the world’s postal, parcel and express business. The event in 2019 will provide the most significant opportunity for postal operators, couriers, e-fulfilment companies, cross-border shippers and delivery companies to debate current issues and form business relationships on a global scale. With more than 3,000 people attending each year from more than 100 countries, PARCEL+POST EXPO is the global meeting place for the industry. The free-to-attend PARCEL+POST EXPO Exhibition is the world’s largest annual postal and parcel exhibition. With 160 international exhibitors, it provides an excellent opportunity to get a first-hand look at the latest innovations and technologies driving this industry forward, from industry-leading partners to brand-new startups. The 2019 PARCEL+POST EXPO Conference will host expert speakers debating and discussing the key issues and future for the global postal and parcel delivery industry. Sessions this year include: e-commerce and last-mile delivery, logistics, digital disruption, strategic directions, autonomous futures and expanding financial services, to name just a few. The Universal Postal Union conference sessions are always a highlight of PARCEL+POST EXPO, and 2019 will feature special sessions discussing the future strategic direction of the postal industry. 2018 show a huge success! 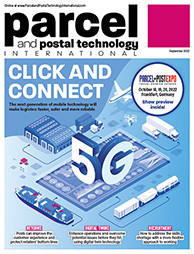 From software solutions controlling fleets of automated sorting robots and business intelligence tools analysing data to route optimisation and automated guided vehicles for last-mile delivery, PARCEL+POST EXPO 2018 brought together a host of new technologies showcasing how the postal industry is being transformed as a result of advanced robotic and digital solutions.